FORSAN - The Coahoma Bulldogettes split their first two games at the Forsan Tip Off Classic Thursday as they sailed past the Big Spring High School Lady Steers JV team 53-30 but lost to Garden City,11-56. Caitlyn Corley netted 16 points and MaKynlee Overton added 11 more to help lead the Bulldogettes to a victory against the Lady Steers JV team in the second game of the tournament. Corley has been a force for her team on offense this season. The Coahoma High School junior and Overton racked up 7 points apiece accounting for 14 of the 21 left on the scoreboard at the end of the first quarter. Paige Atkins and Kenzi Canales both contributed hard-won baskets and Ashley Romero netted a sweet 3-pointer to give the Bulldogettes a 14-point cushion heading into the second. After a strong start, both teams slowed down on offense in the second quarter. Coahoma netted 7 more points while keeping the Lady Steers to 4. By the half, the Bulldogettes had a 17-point lead (28-11). Returning from the lock rooms, both teams were refocused on the game. Atkins buried a shot at the 7:23 mark in the third quarter to start off the Bulldogette offense and was followed by Canales and Overton to up the score 35-12. With baskets by Corley, Romero, and Jovi Gonzales, the Bulldogettes headed into the fourth 17 points richer. The Lady Steers also had their best quarter yet netting 11 points. Both teams were relatively quiet at the post in the fourth bringing in 8 points each. This is Coahoma’s (2-3) second win of the non-district season. Coahoma: Cailtyn Corley, 16; MaKynlee Overton, 11; Ashley Romero, 9; Kenzi Canales, 7; Paige Atkins, 4; Julia Cortez, 2; Macee Grant, 2; Jovi Gonzales, 2. 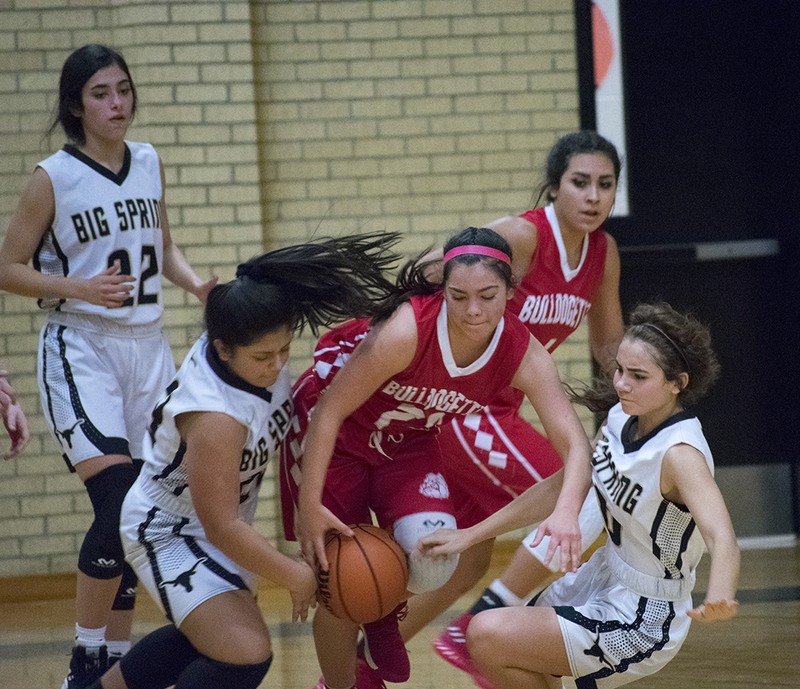 Big Spring: Terrazas, 20; Trevino, 4; Kuykendall, 3; A . Delgado, 2; Castillo, 1. Coahoma: Romero, 1; Canales, 1. 1st half: Coahoma, 8; Big Spring, 9: 2nd half, Coahoma, 9; Big Spring, 7. Abby Lopez led the Bulldogettes in offense netting 4 points during a tough 11-56 loss to Garden City in the early game of the Forsan Tip Off Classic tournament Thursday morning. The No. 8-ranked Lady Kats have been dominate so far this year coming into the tournament with a 5-0 record. During the game, the team kept the Bulldogettes to single digits each quarter on the scoreboard. Later in the evening, the Lady Kats beat Midland Christian 57-39. Coahoma: Abby Lopez, 4; Caitlyn Corley, 3; Ashley Romero 2; Jovi Gonzales, 2. Garden City: Jordan Driver, 10; Avery Jost, 5; Allison Halfmann, 8; Rita Flores, 4; Lyndee Walker, 8; Ixchel Sotelo, 8; Angelica Munguia, 13.